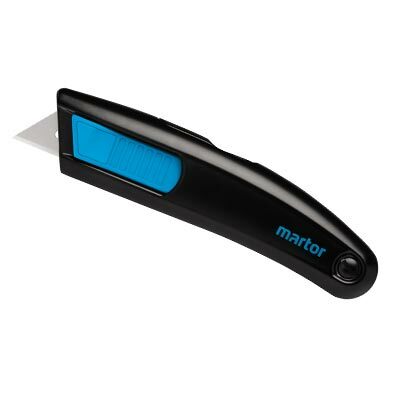 These heavy duty Martor safety knives have a 0.63 mm thick blade suitable for use with virtually any type of material. The ergonomically styled aluminium handle provides perfectly controlled cutting operations and is ideal for use by right- and left-handers, even when wearing protective work gloves. The automatic blade retract springs into action the moment blade edge contact is lost - even when the user holds on to the blade slider. It also works no matter how far the blade is extended, meaning operator safety is better protected. Martor's Megasafe has been recognised as one of the finest work knives in the world, and in 2006 received an iF design award, an international award for outstanding product design. And like all Martor knives, it has been tested and approved by the German Safety Control Board TÜV. 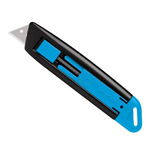 Maximise your purchasing power with our Budget Safety Knives! 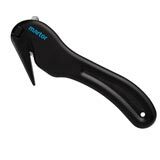 Award-winning safety cutter by Martor - Easysafe Sheet Cutter. Do you need any Replacement Blades? 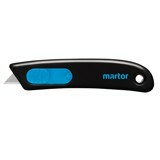 We always keep Martor safety knives in stock ready for same day dispatch so you need never lose your cutting edge.